TME is one of the most innovative companies! We have a pleasure to inform that TME has joined a prestigious group of 500 most innovative companies in 2010. 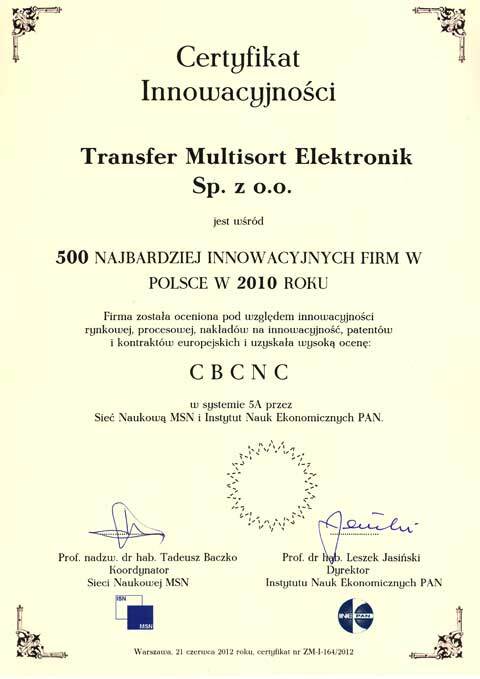 The company has been evaluated against market, process innovation, innovation expenditures, patents, European contracts and obtained high CBCNC grade in the system 5A by MSN Scientific Network and Polish the Institute of Economic Sciences of Polish Scientific Academy PAN. TME recognized in the Forbes Diamonds 2014 ranking! TME was ranked no 3 in the “Global companies 2013” ranking! TME achieves the highest position among all distribution companies in Poland! TME a winner of the Good Company ranking! TME a Winner of the 2012 Family Companies Competition!